RESTful web services with Java (Jersey / JAX-RS). This tutorial explains how to develop RESTful web services in Java. It uses the JAX-RS reference implementation Jersey. In this tutorial Eclipse 4.7 (Oxygen), Java 1.8, Tomcat 6.0 and JAX-RS 2.0 (with Jersey 2.11) is used. REST is an architectural style which is based on web-standards and the HTTP protocol. This style was initially described by Roy Fielding in 2000. In a REST based architecture everything is a resource. A resource is accessed via a common interface based on the HTTP standard methods. In a REST based architecture you have a REST server which provides access to the resources. A REST client can access and modify the REST resources. Every resource should support the HTTP common operations. Resources are identified by global IDs (which are typically URIs). REST allows that resources have different representations, e.g., text, XML, JSON etc. The REST client can ask for a specific representation via the HTTP protocol (content negotiation). The PUT, GET, POST and DELETE methods are typical used in REST based architectures. The following table gives an explanation of these operations. GET defines a reading access of the resource without side-effects. The resource is never changed via a GET request, e.g., the request has no side effects (idempotent). PUT creates a new resource. It must also be idempotent. DELETE removes the resources. The operations are idempotent. They can get repeated without leading to different results. POST updates an existing resource or creates a new resource. A RESTFul web services are based on HTTP methods and the concept of REST. A RESTFul web service defines the base URI for the services, the supported MIME-types (XML, text, JSON, user-defined, …​). It also defines the set of operations (POST, GET, PUT, DELETE) which are supported. Download the Jersey distribution as zip file from the Jersey download site. 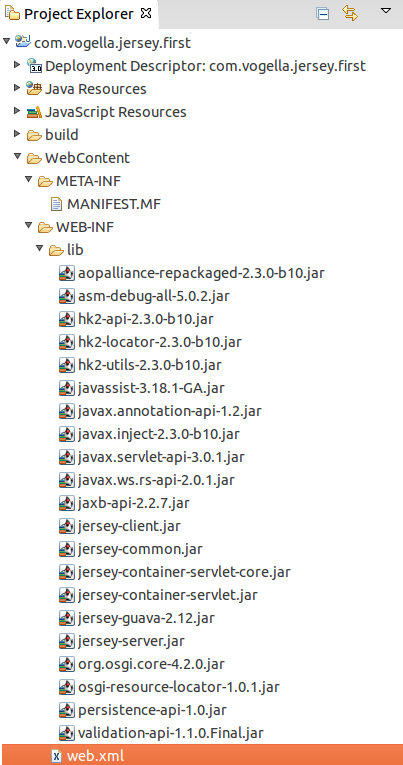 The zip contains the Jersey implementation JAR and its core dependencies. It does not provide dependencies for third party JARs beyond those for JSON support and JavaDoc. Copy all JARs from your Jersey download into the WEB-INF/lib folder. For this tutorial you can use any web container, for example Tomcat or the Google App Engine. If you want to use Tomcat as servlet container please see Eclipse WTP and Apache Tomcat for instructions on how to install and use Eclipse WTP and Apache Tomcat. The following description is based on a local Apache Tomcat installation. This section describes how to setup Eclipse WTP in a Gradle project. This is required for the following tutorials. Make sure that you followed the Eclipse WTP Tutorial to install Eclipse WTP. Make also sure that you followed the Eclipse Buildship Tutorial to enable Gradle support for Eclipse. If you have not yet created a Gradle project, you can follow the Buildship tutorial to create one. Open the build.gradle file and add the following two lines. Since we want to create a web application, we want a war file (and not a jar file which would be created by Gradle with the Java plugin). The eclipse-wtp plugin helps you to generate the Eclipse WTP project files. Now, add a new folder with the name WebContent to your projects root. To do so, right click on the projects name New Folder. Add another folder with the name WEB-INF to your WebContent folder. The next step is to add a xml file with the name web.xml to the created WEB-INF folder. To do so menu: right click on the created folder name[New > Other…​] and select XML file. Perform a right-click on the project and select Gradle Refresh Gradle Project…​. This will add various new tasks to your Gradle Tasks view. The following description assumes that you are familiar with creating web applications in Eclipse. See Eclipse WTP development for an introduction into creating web applications with Eclipse. Create a new Gradle project named com.vogella.jersey.first with com.vogella.jersey.first as the top-level package name and configure Eclipse WTP. You can follow Required setup for Gradle and Eclipse web projects to get started. To import the Jersey dependencies, add the following dependency to your build.gradle file. // The class registers its methods for the HTTP GET request using the @GET annotation. // text, XML and HTML. // The browser requests per default the HTML MIME type. return "<html> " + "<title>" + "Hello Jersey" + "</title>"
This class register itself as a get resource via the @GET annotation. Via the @Produces annotation it defines that it delivers the text and the HTML MIME types. It also defines via the @Path annotation that its service is available under the hello URL. The browser will always request the HTML MIME type. To see the text version, you can use tool like curl. You need to register Jersey as the servlet dispatcher for REST requests. Open the file web.xml and modify it to the following. The parameter jersey.config.server.provider.packages defines in which package Jersey will look for the web service classes. This property must point to your resources classes. The URL pattern defines the part of the base URL your application will be placed. This URL is derived from the context root value in the projects properties Web Project Settings (by default, this is your application name), augmented with the servlet-mapping URL-pattern and the hello @Path annotation from your class file. You should get the message "Hello Jersey". As we are using Gradle, if you want to update the context root include the following in your build.gradle and update your web container (right click on server Publish in the Servers Eclipse View). The browser requests the HTML representation of your resource. In the next chapter we are going to write a client which will read the XML representation. Jersey contains a REST client library which can be used for testing or to build a real client in Java. The usage of this library is demonstrated in the following tutorial. Create a new Java gradle project with com.vogella.jersey.first.client as top-level package name and add following dependency to your build.gradle file to import the Jersey dependencies. Create the following test class. JAX-RS supports the automatic creation of XML and JSON via JAXB. For an introduction into XML please see Java and XML - Tutorial. For an introduction into JAXB please see JAXB. You can continue this tutorial without reading these tutorials, but they contain more background information. Create a new Gradle project named com.vogella.jersey.jaxb with com.vogella.jersey.jaxb as the top-level package name and configure Eclipse WTP. You can follow Required setup for Gradle and Eclipse web projects to get started. To enable JSON support, add the following dependency to your build.gradle file. The second line automatically adds support for the media type application/json. Create the following resource class. This class simply returns an instance of the Todo class. Change web.xml to the following. Run you web application in Eclipse and validate that you can access your service. Your application should be available under the following URL. Create a new Java Gradle project with com.vogella.jersey.jaxbclient as top-level package name and add the following dependencies to your build.gradle file to import the Jersey dependencies and enable JSON support. This section creates a CRUD (Create, Read, Update, Delete) restful web service. It will allow to maintain a list of TODOs in your web application via HTTP calls. Create a new Gradle project called com.vogella.jersey.todo with com.vogella.jersey.todo as top-level package name. Add the following to dependency to your build.gradle file and make also sure, that you enabled Eclipse WTP support by following Required setup for Gradle and Eclipse web projects. Change the web.xml file to the following. Create the following data model and a Singleton which serves as the data provider for the model. We use the implementation based on an enumeration. Please see the link for details. The Todo class is annotated with a JAXB annotation. See Java and XML to learn about JAXB. The REST service can be used via HTML forms. The following HTML form will allow to post new data to the service. Create the following page called create_todo.html in the WebContent folder. Create the following classes which will be used as REST resources. This TodosResource uses the @PathParam annotation to define that the id is inserted as parameter. You should see the XML representation of your TODO items. to see the TODO with ID 1. We currently have only TODOs with the ids 1 and 2, all other requests will result in an HTTP error code. Please note that with the browser you can only issue HTTP GET requests. The next chapter will use the Jersey client libraries to issue get, post and delete. To test your service you can create a new class in your server project. This project has already all required libs in the classpath, so this is faster than creating a new project. The above example contains a form which calls a post method of your rest service.